Renault will extend production of the Clio Campus at its Flins factory near Paris. PARIS -- With scrapping incentives boosting demand for small cars more than expected, Renault announced late last week that it will continue manufacturing the Clio Campus at its Flins factory near Paris through December. 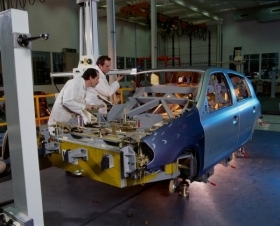 The change means that Renault will produce an additional 4,000 Clios at the plant. Renault initially announced last March that it would shift about 8,000 units of Clio Campus production to Flins during the June to October period to free up manufacturing capacity at its factory in Novo Mesto, Slovenia. Renault's strategy was designed to allow higher production of the Twingo minicar in Slovenia, which was having trouble meeting high consumer demand for small, fuel-efficient models. The French automaker produced 65,427 Clios and 132,416 Twingos in Slovenia in 2008. The decision to move some Clio Campus production to France came just weeks after the French government agreed to loan Renault 3 billion euros, in exchange for commitments to maintain manufacturing and employment in France. Renault insists that the shifting of Clio Campus production to Flins was motivated by market conditions, rather than politics. Demand for the Clio Campus remains strong despite competition from the newer third-generation Clio. The Clio Campus is helped by a 9,900 euro starting price and an Internet promotion that allows would-be buyers to make customized purchase orders online, Renault said. Renault sold 4,429 Clio Campuses in May and reported a volume of 29,350 unit after five months.